Adorable, right? Head on over to the post and grab the free template. 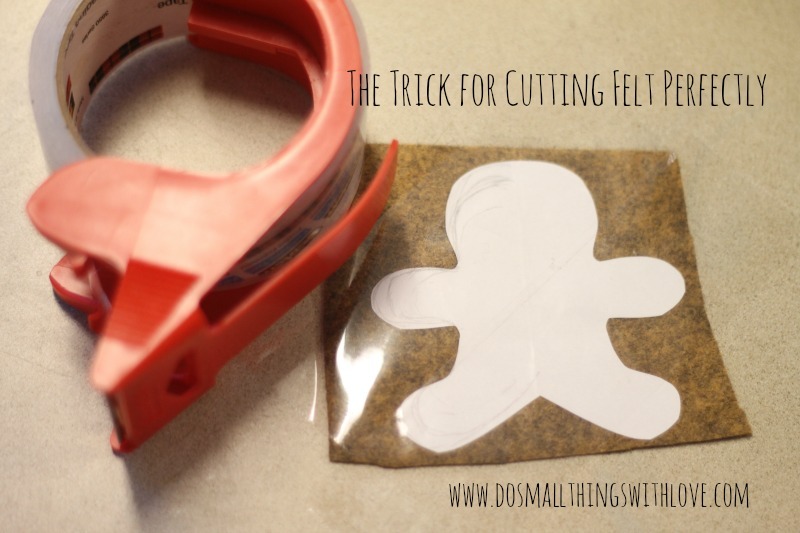 But, before we get there, here is a little tip that will forever change the way you cut felt–and give you new found confidence when you attempt to cut out detailed little pieces—USE PACKING TAPE. First, grab the FREE TEMPLATE, then cut it out and tape it down to the felt. This is how I cut out all of my felt pieces for all of my projects. I cut out a piece of felt slighter bigger than the shape I want to cut. Then I place down my pattern and cover the entire thing with clear packing tape. I cut out a smaller piece of felt because the packing tape will pull at the felt when you remove it, but the piece I want is protected by the pattern. So, with the pattern securely held in place by the tape, I cut out each piece perfectly! Ta da! Is your life changed? 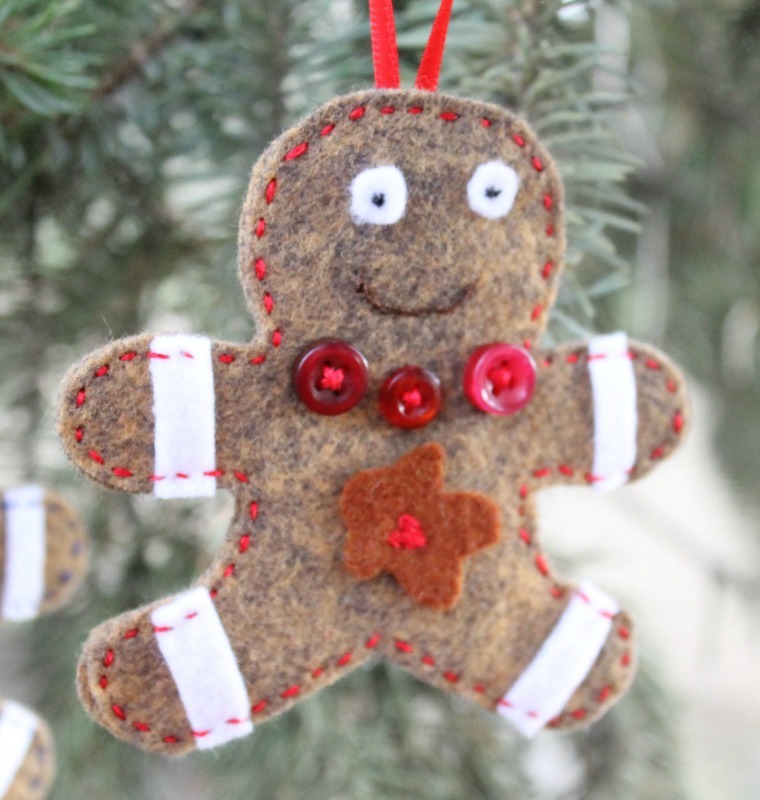 Once you have the bodies of your Gingerbread Men cut out, follow these steps to complete the ornaments. 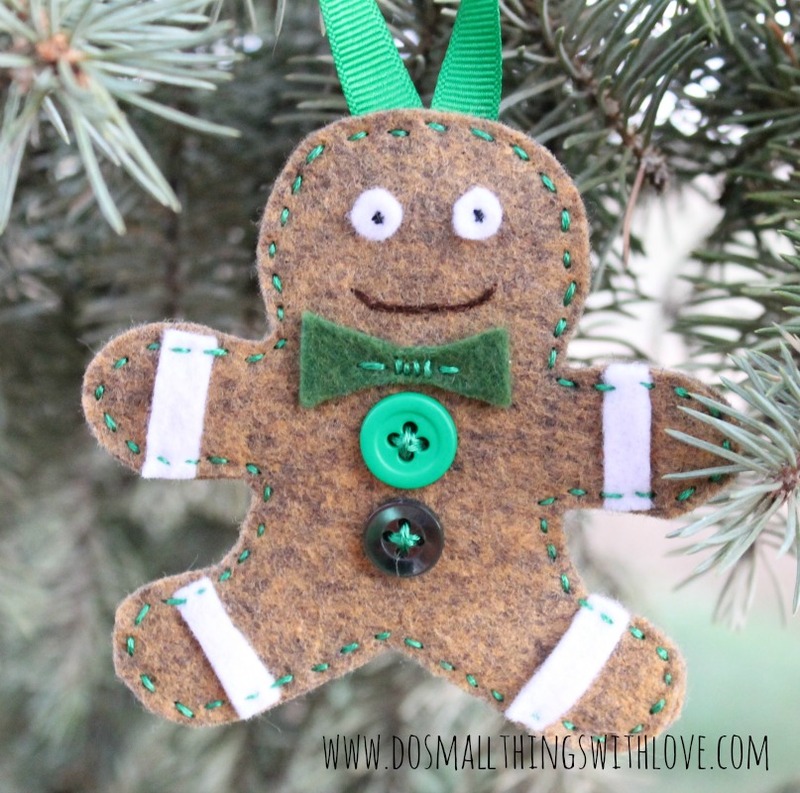 Using the method described above and the FREE TEMPLATE, cut out 2 gingerbread man body pieces for each ornament you plan to make. 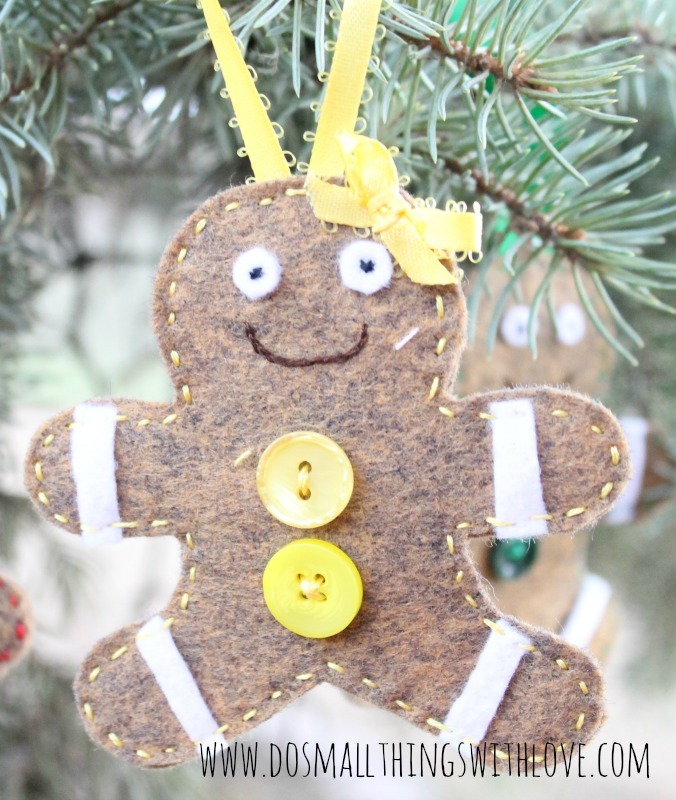 Then, use tiny circles of white felt and black thread to create the eyes. 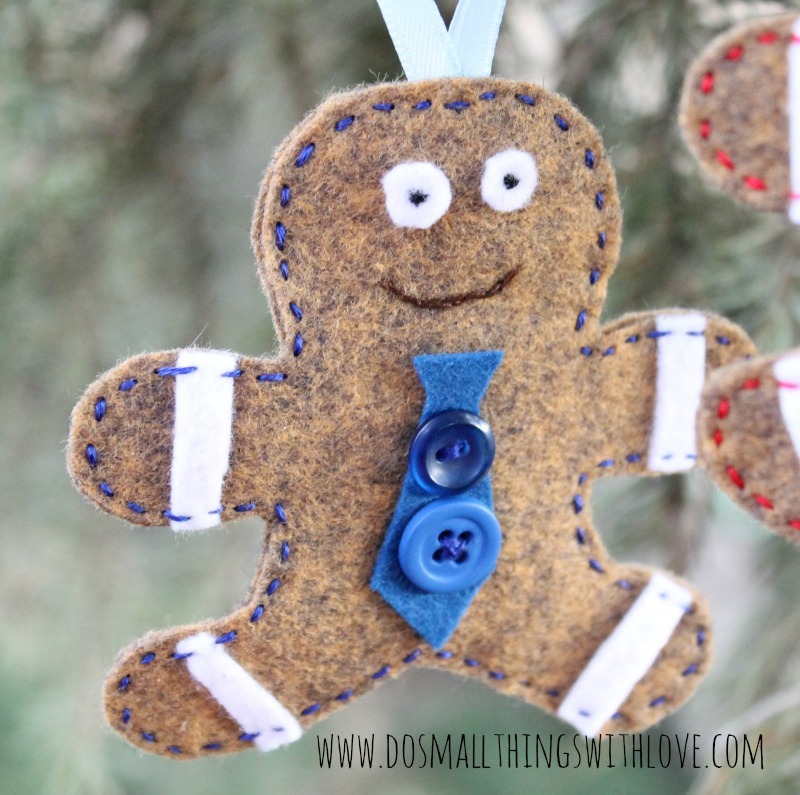 Add embellishment to each gingerbread man. 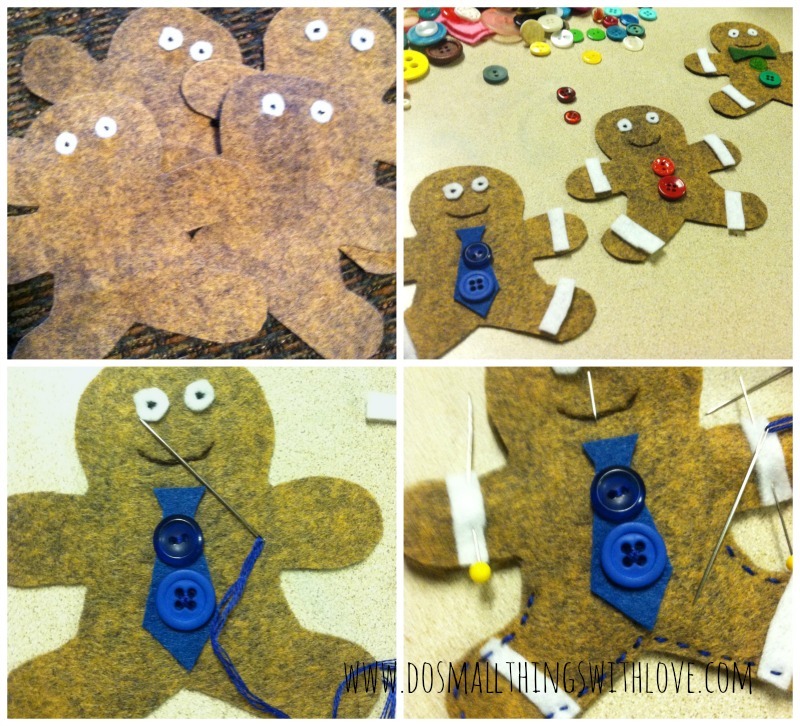 I used a strip of white felt on each limb, buttons and bits of felt for various clothing items. Stitch down the buttons, or whatever will be added to the tummy first. Then, using straight pins, place the second body piece behind the first. 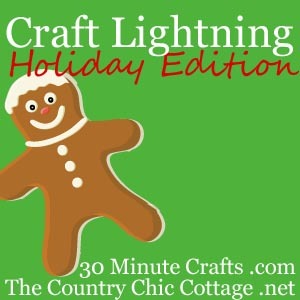 Pin the white strips in place and add a ribbon for hanging that is sandwiched between the two body pieces. Stitch around the entire perimeter with a running stitch, making sure to stitch down the white stripes and ribbon as you go. Annnnnd, there you have it! My husband, wearing a dabber tie. Me, wearing a button necklace…and carrying a little baby in my tummy. Our Toddler, wearing a classic bow tie. And, out sweet little baby girl, wearing a bow in her hair. 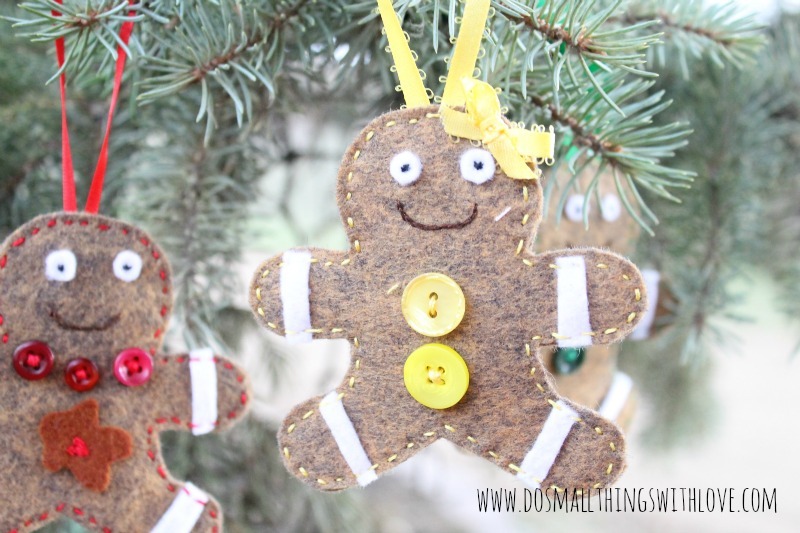 I love how they turned out, and I hope that you have just as much fun putting together ornaments for your family this year! 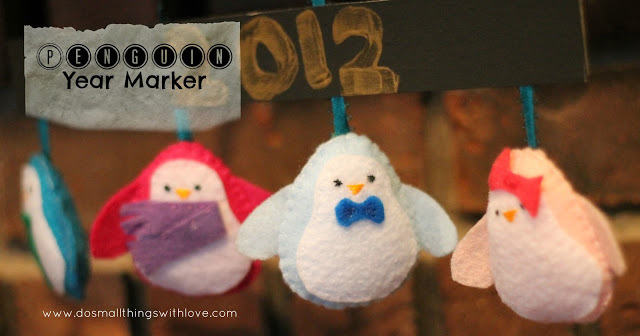 Nancy, these ornaments are ADORABLE!!!! Cuteness overload!! Thanks for participating Nancy!